Custom built by and for high end Island builder so endless details abound! 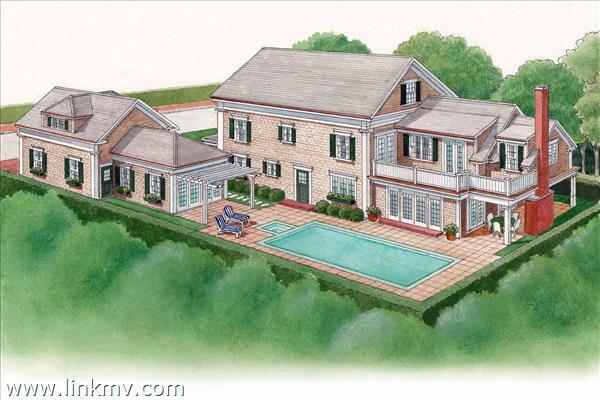 This LEED CERTIFIED house measures over 9,000 square feet with 5 ample bedrooms, 6 full baths and 3 powder rooms. It is wide open with rambling qualities to accommodate generational family gatherings. Easy going and aristocratic simultaneously blending old with new using sustainable materials including 200 year old flooring and beams. Perfect for summer entertaining with large covered porch complete with dining for 12, 2 fireplaces and wonderful living area overlooking the pool, yard and gardens. Every amenity possible including steam shower, sauna, 2 outside showers, hot tub, gym, theater, game room, mahogany inside/outside bar, office and breathtaking Lew French living room fireplace set in an inverted hull mahogany ceiling with 3 balconies overlooking this Great Room. Absolutely spectacular and a must see! Plus separate 5 bedroom, 3 bath carriage house. VINTAGE CHIC CAPTAIN'S HOME + GUEST COTTAGE WITH SWEEPING HARBOR VIEWS. Built originally at the turn of the century, this exquisite home was beautifully renovated by Parker & Company in 2012 and transformed into an ultra chic, luxurious harborside residence loaded with vintage charm. The MAIN HOUSE features refinished original wood floors and custom millwork throughout -- including coffered ceilings, raised paneling, beaded board paneling, built-in window seats and bookshelves.The gourmet cook's kitchen is highlighted by vaulted ceilings with pressed tin tiles, custom turned leg cabinetry, marble countertops, a counter-height bar with seating and top notch appliances throughout. There are sweeping views of the Edgartown Harbor and Lighthouse from most every room in the house including the second-floor Master Bedroom suite with a built-in desk and outdoor deck, both positioned to take advantage of the magnificent water views. A spacious COVERED PORCH expands the full width of the Main House and is a perfect place to enjoy alfresco dining and entertaining . . . or simply enjoying views of boats coasting by on the bustling harbor. A PRIVATE COURTYARD connects the Main House and Guest Cottage and is another perfect place to enjoy morning coffee or a relaxing afternoon lounging with a book. The delightful GUEST COTTAGE features French doors that open into a beautiful first-floor Living Area with vaulted ceilings, a kitchenette with farmer's sink and full bath. For sleeping accommodations, there is a private bedroom on the first floor and a second-floor loft sleeping area with built-in twin beds.The professionally landscaped yard features terraced perennial gardens with stone walls and steps that lead to an expansive lawn and boathouse, framed by a picket fence and Collins Beach as the backdrop. The BOATHOUSE is located on the edge of the property, adjacent to Collins Beach and a perfect place for storing watercraft and bicycles -- it or can also be used as a Game Room with ping pong table! Exquisite designer furnishings and contents are available for separate purchase for a complete turkey purchase opportunity! Rarely does a home of this quality and character come onto the market - truly a gem! 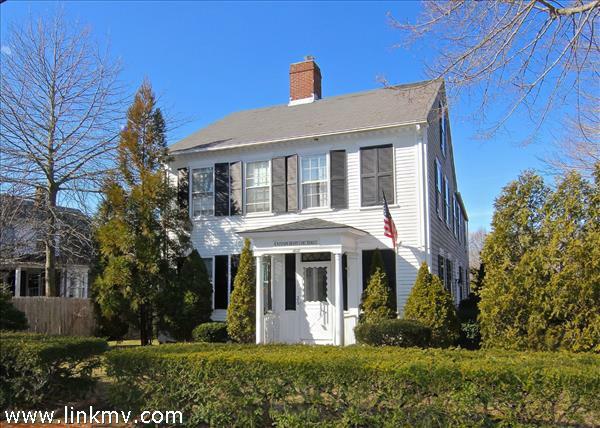 Located in the heart of historic downtown Edgartown on a prime commercial street lies this beautiful 1820's Colonial building on nearly 15,000 sq. ft. of property. There is substantial frontage on North Summer Street just a half block from Main Street. In addition, the rear of the property fronts the entire rear length of the town parking area that also offers entrances to a number of commercial businesses, including Espresso Love, Isola Restaurant and the Edgartown Cinemas. 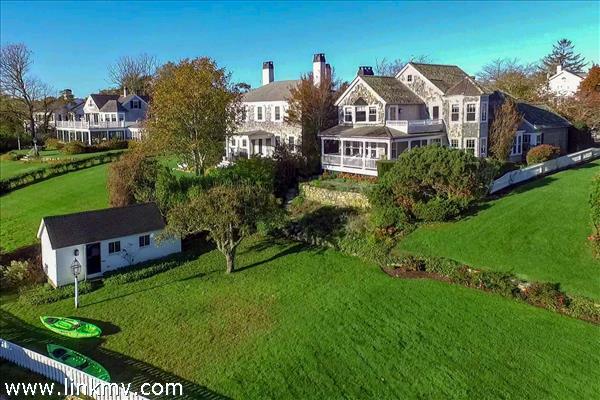 This property has tremendous potential to offer the many usages allowed in the Edgartown B1 district and could provide a wonderful mix of retail, office and residential uses. Please call to preview this unique opportunity. 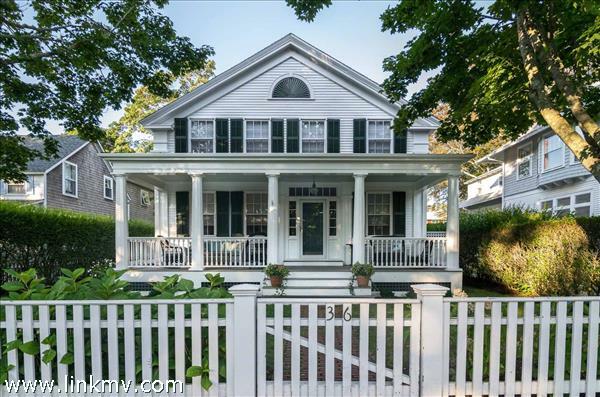 DISTINGUISHED Period Greek Revival Home located in an Historic Edgartown Neighborhood. 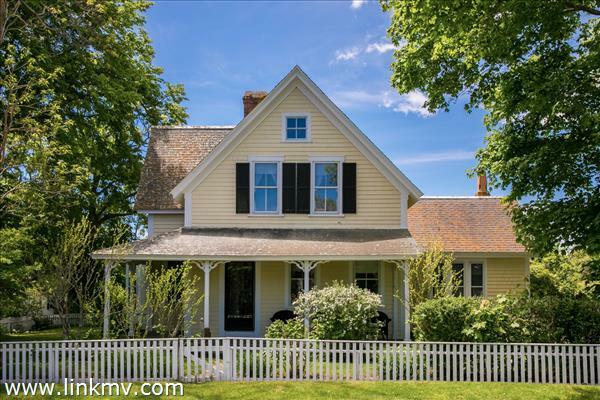 This 1849 Captain's House style home has been fully renovated and tastefully updated for today's living, while maintaining its authentic historic charm. Period details include, antique wide planked floors, four original fireplaces, period millwork and built-ins throughout, all of which are in exceptional condition. This classic village home blends formal and casual living areas within two floors of multiple living spaces. The inviting eat-in kitchen features high ceilings, updated appliances, refinished wide plank floors, all opening out on to an expansive flagstone terrace and private back yard, perfect for outdoor dining and entertaining. Exterior features include an elegant front porch featuring authentic Greek Revival style columns; windows feature antique French cast iron Shutter Dogs. The contemporary Guest Cottage is located at the other end of the backyard and gardens and features a nautical style interior with open living spaces including a full galley kitchen, dining and living area. The second floor bedroom has vaulted ceilings with varnished bead board and balcony overlooking the open first floor living area. The property also has two single car garages. Edgartown Harbor, the lighthouse and all the best of village living awaits, just outside the front door. This precious gem will truly capture your heart. 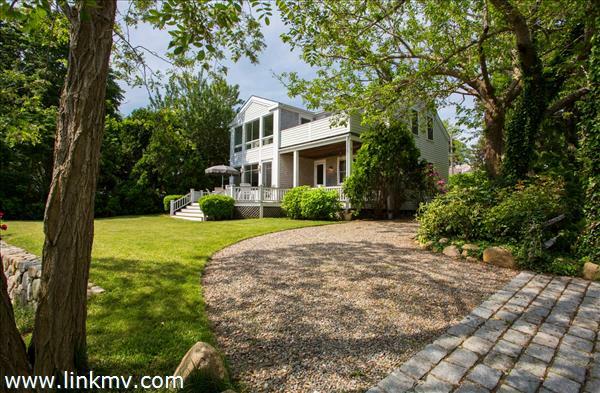 GRAND AND LUXURIOUS POOLSIDE LIVING IN EDGARTOWN VILLAGE - PRICE REDUCED $400,000. 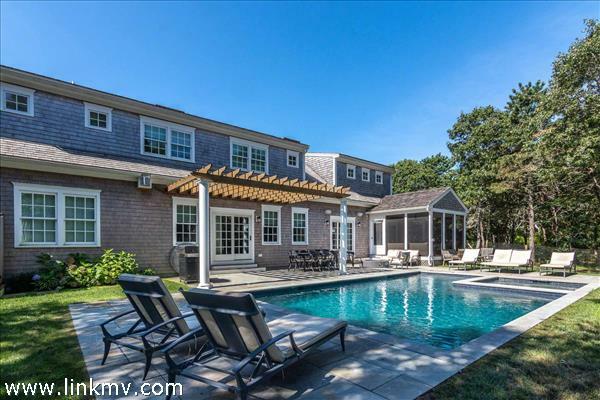 Here's a unique opportunity to customize this newly built Edgartown home with pool. Located in the heart of historic Edgartown Village, this luxurious colonial -- which features six (6) bedrooms and over 4500 square feet of living space -- has been designed to integrate indoor and outdoor living around a beautiful private courtyard with gunite pool, whirlpool spa and terrace. Designed by noted architect, Patrick Ahearn, the first floor is comprised of a grand, open-designed Great Room with 9-foot ceilings blending traditional living spaces with contemporary flair and panache. The Great Room features hardwood floors, coffered ceilings with v-groove detailing and a gas fireplace flanked by built-ins and French doors that open onto an outdoor Portico, perfect for outdoor lounging around the brick wood-burning fireplace. A entire wall of French doors and windows connect the Great Room to the pool courtyard. The Gourmet Cook's kitchen features top-notch appliances (Wolf®, SubZero®, etc.) custom milled cabinetry, honed granite countertops and a large center island. The second floor of the home is comprised of three bedrooms, all with en suite baths, including a luxurious Master Bedroom suite with outdoor mahogany deck overlooking the pool area -- plus a walk-in closet and gorgeous master bath with double marble vanity, walk-in glass shower and soaking tub. The Lower Level offers approximately 1300 square feet of additional space including a deluxe Media Room, Bedroom, Full Bath with glass walk-in shower and Laundry Room. The detached Carriage House offers another bedroom with en suite bath plus an attached Pool House with pergola, wet bar, and full bath with shower. The heated 16x32-foot gunite pool and attached whirlpool spa with Pebble Tec® finish is surrounded by a goreous stone terrace, privacy fence, and gardens. Other extras of this home include central air, security system, and more! Beautifully selected furnishings by Shawn Chapps of Chapco Design are available separately for a turnkey purchase opportunity. Note: Photos shown here are from a home with similar first floor living spaces. PRECIOUS ANTIQUE GEM ON NORTH WATER STREET. 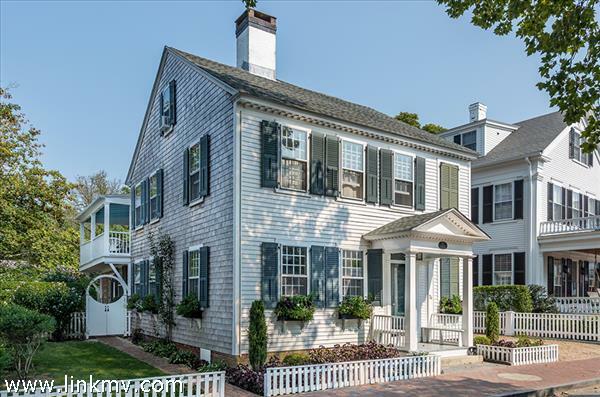 Sitting majestically on North Water Street, this circa 1830's Captain's House has been tastefully updated while maintaining its authentic historic charm. Period details include an open staircase, antique wide planked floors, six original fireplaces, period millwork and built-ins, all of which are in exceptional condition. This classic village home blends formal and casual living areas within three floors of generous living spaces for easy living and entertaining. The inviting eat-in kitchen features vaulted ceilings and a cozy sitting area, which make it the perfect gathering spot of the home. French doors open from the kitchen onto a brick terrace and expansive private yard, which is perfect for outdoor dining, entertaining and family plan during the summer months. The backyard will nicely accommodate an in-ground pool and terrace. Another unique feature of this charming property is a covered second-floor porch where you can relax with a cup of coffee or a good book and enjoy the sparkling water views of Edgartown Harbor just across the way. Of course, Edgartown Harbor, the lighthouse and all the best of village living awaits, just outside the front door. This precious gem will truly capture your heart. In-town charmer. 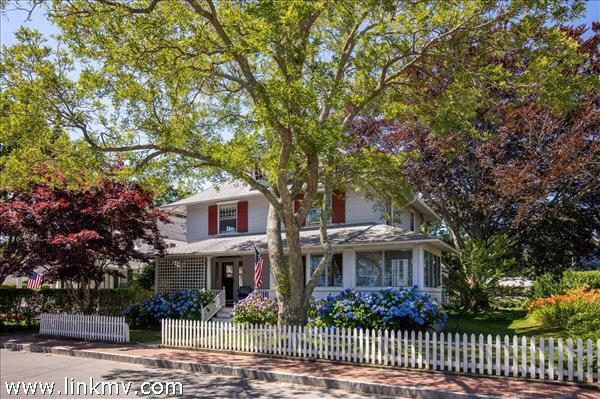 This 5-bedroom Victorian is located on a quiet street of multimillion-dollar homes, and represents an opportunity for the buyer seeking entrée into one of the island's most distinguished neighborhoods. Tucked away from all the hustle and bustle of village living yet it is an easy stroll to Edgartown Harbor, shopping, restaurants, and Fuller Street Beach. With one-third of an acre of land, there are plenty of options for the future owner, whether it involves a major renovation and/or addition, swimming pool, or new construction. Experience village living in one of New England's most charming communities. Ready for summer use! 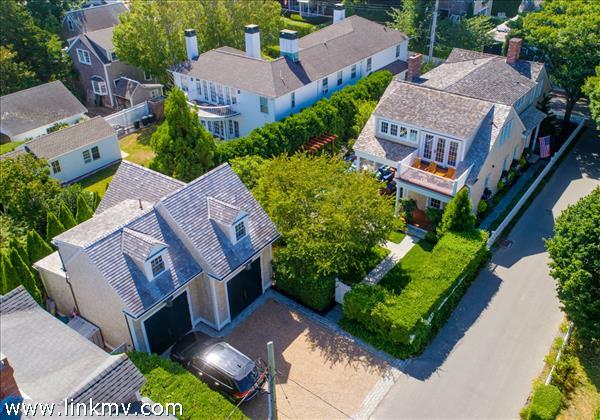 Close to downtown on a quiet side street, this 2,325-SF house with water views and magical morning light is steps away from a secluded beach overlooking the town's outer harbor. With three en-suite bedrooms upstairs and a downstairs den, first-floor and upper decks facing the water, and proximity to the Vineyard Haven Yacht Club and West Chop, this architect-designed contemporary offers comfortable and convenient summer living. The open floor plan flows around a floor-to-ceiling central fireplace, with expansive windows and plenty of built-in storage. 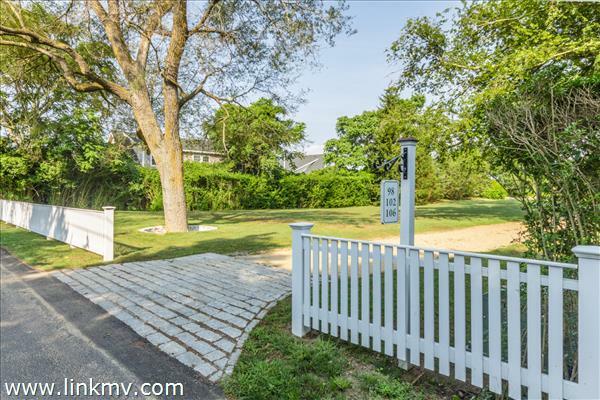 The .20-acre corner lot features mature landscaping and a large sunny lawn with a field stone wall. Other amenities in this beautifully renovated home include a spacious garage, central air, unfinished basement, and an airy, light-filled mudroom.